Re-Discover Adobe History in the heart of the Southwest. Experience Taos. Experience Adobe History. Experience Your Soul. Choose our Most Romantic Taos Bed and Breakfast Inn to stargaze on a private deck or relax in an over-sized sumptuous bath with a second fireplace, soaking tub and private sauna. Each room is unique with its own special charm. ​Enjoy a gourmet breakfast overlooking a flower-filled courtyard. Your host Christine provides a luxurious, romantic, and beautiful 1830's adobe hacienda in a country setting. Adobe & Pines Inn is centered around a historic adobe hacienda preserved with its original architectural elements and transformed into one of the most charming and luxurious hide-aways in the Southwest, according to The New York Times, Frommer's, Fodors, Weekends for Two in the Southwest, and many additional travel guides/reviews. The Inn was named Top Ten Most Romantic B&B by American Historic Inns and Best of the Southwest by BedandBreakfast.com. Our Taos Inn has also been featured on HGTV and in Better Homes & Gardens in September and most recently featured in Edible magazine. ​Adobe & Pines Inn guests can relax while enjoying works of fine art by Taos artists, scenic country grounds and private patios for strolling and sitting, full gourmet breakfasts. Guests may also enjoy the Inn's DVD, book and CD music collections, and an eclectic array of games. to sit and talk and enjoy the peaceful splendor of the Taos sunrise or sunset. The most evident of the historic 1830 'preserved architectural elements' is the low overhang entrance to the grand portal and the short door to the lobby. The whispering of our stream (acequia) traversed by the old stone bridge is a delight. Away from the busy sounds of the town, the stillness enfolds the old adobe in Winter, while brilliant flowers and gentle breezes greet you in the Spring. Against the wondrous backdrop of the ever-changing color on Taos Mountain, enjoy our orchard with fruit trees and wild asparagus while breathing the fresh, clean air with the faint bouquet of pine and sweet grass. Settle down in our sun room in front of the wood burning stove, which overlooks the flagstone courtyard. Read or nap in a hammock under a 100 foot pine tree for a moment or two, or find your own quiet spot to get away and slow down. We have lots of them. 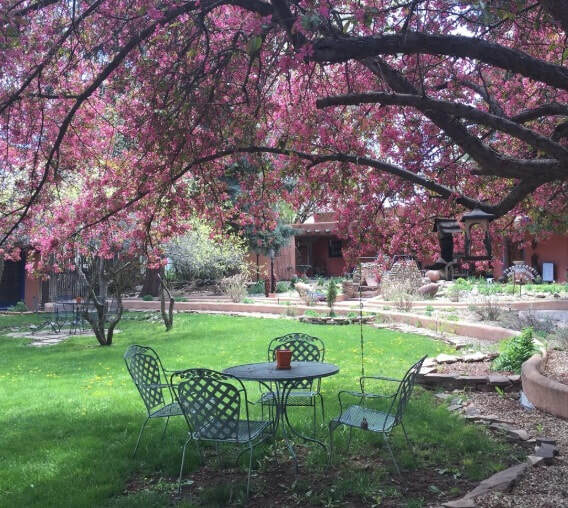 After searching for a haven which embraced the beauty and magic of nature, we can share with you the Adobe and Pines Inn in Taos, a place we believe a wonderful discovery for your Taos romantic getaway. As the fire leaps in the corner fireplace and shadows dance on the softly contoured adobe walls, it is more than the warmth of the fire that our guests feel. Laughter and happy voices fill the Inn. ​Surrounded by nature's beauty, there is a quality of relaxation and casual elegance. Puerta Verde is a historic room in the original part of the original 1832 adobe hacienda. There is a wonderful Madonna and Child retablo intact above the kiva fireplace. Puerta Verde has a small sitting area, books, artwork by Taos artists, queen bed with featherbed topper, Dutch door opening onto the Grand Portal, tile floors, coffee/tea service, and private bath with tiled shower. ​southwest adobe wall. Please note that this room does not have a television. Puerta Azul is an absolutely beautiful, cozy hideaway with a private entrance off the Grand Portal, just steps from the Main Inn living room. Puerta Azul is part of the original 1832 adobe hacienda. 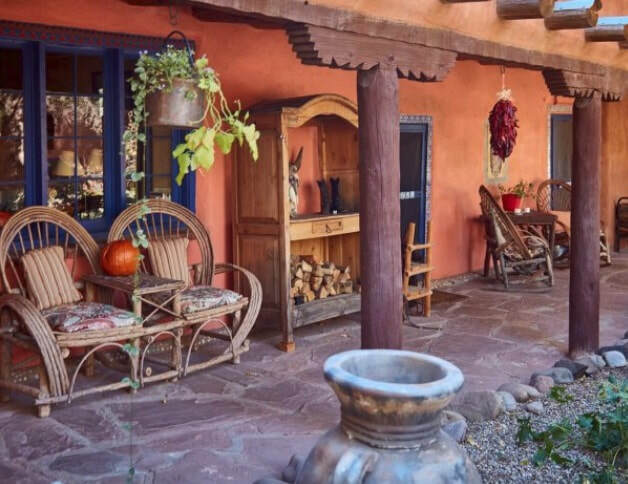 This oasis has original vigas and a hand-painted kiva fireplace. There is a queen bed with featherbed topper, brick floors, and private bath with a Mexican tiled shower. Richly colored and warm, Puerta Azul is the most petite room at the Inn. Puerta Violeta is the only second-floor guest room in the Inn and has our only King size bed. It has a private entrance off the garden courtyard. In the day, the magic of Taos Mountain sparkles through large picture windows lighting up the colors decorating this bright, spacious room. ​glows with embers of native pine and pinon. The romance of this room doesn't end in the bedroom -- pour a glass of wine and settle into the oversized jetted tub or step out onto a private outdoor deck and relax in chaise lounge chairs. A mexican tiled bathroom with both a tiled shower and jetted tub, refrigerator/coffee and tea service, TV & DVD player, complete the charm of this delightful getaway. Puerta Turquese is a separate, 1920’s guest cottage with a private entrance off the back garden courtyard. Just steps from the door is a fenced in private two-person hot tub. The large bedroom and sitting area, decorated in crisp, bright colors, has hand-hewn vigas and is bathed in old Taos charm with unique Southwestern tile and turquoise accents. There is also a large corner kiva wood-burning fireplace. In your private bathroom, relax in the jetted tub/shower combo and enjoy the romance of a second corner fireplace. The cottage's kitchen area is equipped for longer stays and in-room dining. ​A private patio with table and chairs makes a perfect place to relax among the back courtyard gardens. 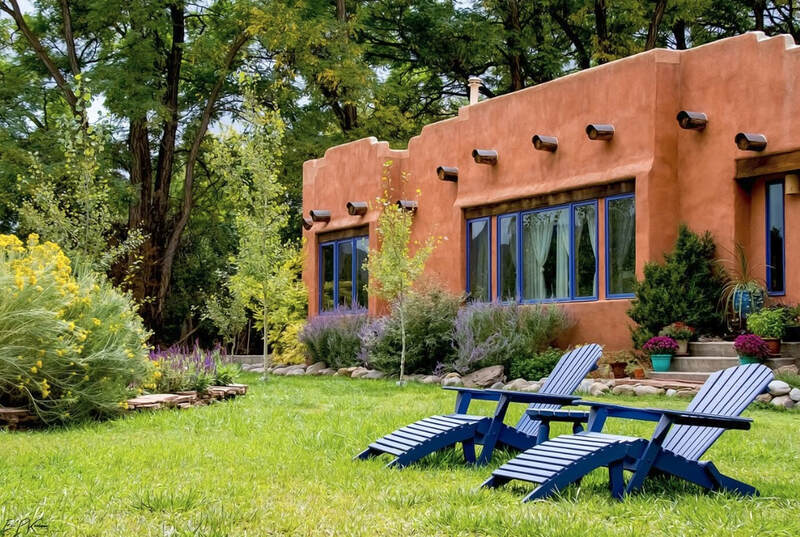 The quaint cabin-like Puerta Turquese is over 100 years old, filled with Taos magic, and perfect for those wanting a taste of the old Southwest. ​The private entrance from the inner garden courtyard leads to a guest room decorated in rich Southwestern hues with viga ceilings, wood burning kiva fireplace, and hand-crafted wrought-iron bed. cream-colored Mexican tiles and deep green accents. The private dry cedar sauna, two-person tiled custom soaking tub, and separate tiled shower is enhanced by the second corner kiva fireplace with bancos which warms the whole room. Refrigerator, coffee/tea service, and double sinks are included along with candles and plush over-sized towels to add to the luxuriant pleasure of this private oasis. Puerta Roja, tucked in amongst a century-old apple tree and a majestic Blue Spruce, is a dramatic and welcoming suite. Its private entrance is a set of French doors that open onto a private portal with a spectacular view of the garden courtyard. The deep burnished red walls gleam and draw a striking contrast against pale, cream-colored floors. Large hand-carved vigas, a built-in bed, and heavy wooden shutters are characteristic of Southwestern design, and add to the charm of this suite. Among the amenities to pamper and comfort you are a soft leather couch where you may relax and be lulled by the enchantment of a nearby gas fireplace, relax and watch a movie on the DVD player, and appreciate the convenience of a kitchenette with refrigerator and coffee/tea service. An arched doorway leads you to another delight for your senses...an elegant and spacious bathroom. You may step into a shower hidden behind a sculptured adobe-style wall, or enjoy relaxing in an oversized jetted bath tub. Imagine a sky light, soft lighting, and the glow of a second gas fireplace in the bath. Puerta Roja, with its rich mix of textures and deep hues of red and burgundy has captured the warm spirit of the Kiva, the sacred ceremonial caves of the Pueblo Indians. Puerta Roja welcomes your spirit to rest and rejuvenate. There is a maximum of four people in Puerta Roja. You enter Puerta Cobre's rustic elegance through French doors from your private portal that faces the garden courtyard. Inviting and warm, the suite's copper interior with turquoise accents beckons you to relax and soak up the unique blend of traditional Southwest design and luxurious comforts. The gas fireplace, designed for year-round use, is perfect for frosty winter dawns or cool summer twilight. The fireplace in the suite's main room can be enjoyed from the sitting area or the queen size bed with featherbed topper, which calls forth Taos-inspired dreams with its spectacular, one-of-a-kind handcrafted iron headboard and bedside tables. ​you're relaxing in the oversized jetted tub. Other bath amenities include spacious double sinks, a walk-in tiled shower and luxurious bathrobes and slippers. Candles and soft wall lighting complete the mood. 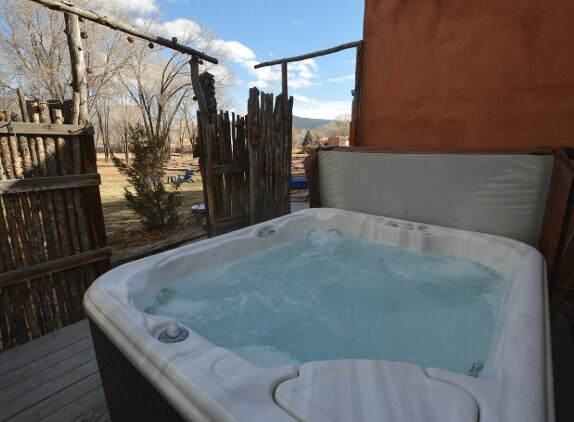 A few steps away from your private portal is a fenced in private two-person hot tub. Puerta Cobre is beautiful in its harmony, magical in its possibilities. Puerta Blanca is our newest and most family friendly room. This beautifully furnished suite has two separate bedrooms, each with a queen size bed with featherbed topper. The private bath has a tub/shower combination. The living room boasts a large leather couch, which opens into a queen sleeper sofa. The living area has a television with DVD Player. It also has a custom built kiva gas fireplace and classic saltillo tile floor throughout the kitchen/living room area. The kitchen is furnished with a gas range, full size refrigerator, microwave and coffee maker. Outside is your own private patio area, complete with seating and a small fire pit to enjoy outdoor fires in the evening. A six person private hot tub is also included with this room! Puerta Blanca is perfect for a family get away, while still offering privacy. The entire suite is warm and inviting with its appointments. The decorations are influenced by both Hispanic and Native American cultures and the hues of red, cocoa, and coral. There is a maximum of six persons in Puerta Blanca. Our hearty 2 and 3 course breakfasts alternate between sweet and savory and are served somewhere between 8:00 to 9:30 a.m. each morning, based on our guests needs and number of guests. Should anyone in your party have dietary restrictions, please let us know when you book so they may be accommodated. Vegan, vegetarian and gluten free options are always available with prior notice. With a day's prior notice, an early breakfast can also be served for those wishing to get to activities or flights early, or a breakfast to-go can be prepared the night before. Breakfast –in- bed is also available – just ask us! Please let us know the day before if you are not going to be with us for breakfast the next day. Our sit-down breakfast alternates between Sweet and Savory with Bacon or Smoked Sausage served as a side. Our Savory Breakfasts start with a seasonal fruit, followed by a homemade bread or pastry, and a hot main course. In the winter months hot Oatmeal, Blue Corn Atoli or Quinoa topped with fruit and nuts is often served. Our Sweet Breakfasts also follow the seasons, starting with a generous serving of a seasonal fruit followed by a Pancake, Waffle or French Toast. ​preserved 1832 historic adobe hacienda. Our Taos Inn is part of the Ranchos de Taos Plaza area, just four miles south of the center of Taos Plaza. There are six such plazas that make up "Taos"‚ a series of plazas that include Ranchos de Taos (just one-third mile from the Inn), La Loma, Talpa, Arroyo Seco and others -- all just a few miles apart around which the Spanish built their original dwellings and established their communities. The earliest history of the Adobe & Pines Inn is that it was part of the Taos Pueblo's (Tiwa's) sacred hot springs area, which is now known as Llano Quemado (dry plain), and still has Hot Springs Road as its primary street up behind the Inn. After the Spanish arrived in the area, the property on which the Inn sits ultimately became part of the King of Spain's land grant to Soldier Cristobal Dela Serna who acquired his lands South of the (Taos) Pueblo on April 8, 1710, when it was granted to him by Governor Jose Chacon Villasenor. Governor Juan Ignacio Flores Mogollon revalidated the grant to Cristobal Dela Serna June 15, 1715, for the soldier Serna had been unable to take formal possession and reside on the land as required because of Military Service.August 5, 1724, Juan and Sebastian Dela Serna, sons of Cristobal Dela Serna, sold the land to Diego Romero. Enjoy the orchards and vegetable gardens all throughout the year from the Springtime blossoms and sprouts, to the harvest and the snow covered resting winters. Every season is magical in the gardens at the Adobe & Pines. Treat your four-legged companion to a daily morning walk through our 3-acres of native landscape. Our happy girls provide us with fresh eggs daily for breakfast. Come with your kids and we’ll keep them busy collecting eggs! Homemade baked goods, organic vegetables from our gardens, and fresh locally sourced ingredients make our breakfasts a great start to your day in Taos! We know our Inn is a magical place! We have created many relaxing spots to sit back and read a good book or sip your morning coffee. Ground yourself with a meditative morning or sunset walk in our Labyrinth or pick up a rake and play in our Zen Garden. Our Labyrinth is surrounded by native plants and is one of the largest and longest in New Mexico. It represents the journey of life, which could explain why so many couples have chosen this spot for their union! Our Inn is the perfect location for your intimate wedding or elopement. Everywhere you look at the Inn could be a perfect setting for the ceremony ~ the Labyrinth, tree-lined meadow, front gardens or the back flagstone courtyard. Dining can be outdoors in a bridal Marque or at the Historic Old Martina's Hall within walking distance of the Inn and the Saint Francis de Asis Church. We have 8 suites that can accommodate 24 of the wedding couple’s family and friends. Contact us for a viewing of the property and a customized wedding quote. We love having your 4-legged companions join you on your vacation! We can provide beds, pop-up nylon crates, and bowls, along with other items you may have forgotten to bring. And of course, plenty of treats! Please contact us regarding a potential dog or cat stay. We welcome our pet guests, but need to speak with you about our policies regarding pets left unattended in their room and interaction with our other guests who may not enjoy your pet as much as you do!. You are welcome to use our outdoor grill! If you do not have a kitchenette in your room we would be happy to store your food in our fridge and share the main Inn’s kitchen after hours. Outdoor seating is available throughout the courtyards and gardens. Come with your electric or hybrid plug-in car and charge overnight! We now have two destination TESLA charging stations and one Universal station for your use, free of charge! There is nothing more relaxing than soaking in an outdoor hot-tub on a starry, moonlit night. Our tubs are available year-round for guests to enjoy. If the room you booked does not include a private hot-tub, ask us if one is available. Adobe & Pines hosts guest’s and their creative activities throughout the year. Our site is well suited for intimate Yoga Retreats, Painting and Photography workshops, Creative Writing exploration and small Group Activities. Give us a call if you are planning a retreat or workshop and are looking for a unique and relaxing setting! We can provide a quote and menu for additional meal options !